When I re-did my home theater a few years ago, I removed the box subwoofer and replaced it with an in-wall unit. I realize that this isn't a suitable replacement, but the goal was to have fewer things for our toddler to bang his head into and fewer wires to pull, so it made sense (I ran a cable to add a traditional sub one day). Anyway, I've never been able to power it and because life has been hectic I've never even had a chance to configure the speakers properly. Clearly, my Denon receiver can't power it alone as it only has a sub pre-out. So I claimed my dad's old amp, an Adcom GFA-535 ii. Apparently it's a fairly respected inexpensive home theater amplifier, but it seems like it's not made for subwoofers. I tried hooking up one channel to the receiver and the sub, but the amp acts like there's no input. When I set up the receiver to send a test tone to the sub, I get nothing at all, and the amp's indicators show nothing. After researching the specs of this amp, it certainly seems to be capable of the frequency range, but I can't figure out what's going on. Any ideas? You have it connected to your Denon sub pre-out? Are you sure the Denon is configured to use that output and that it's actually outputting something? Dig out the multi-meter and check the ohms between the two sub woofer wires (receiver/amp disconnected). It should read pretty near "zero"; otherwise there's a wiring issue. I completely forgot that I never responded to this thread. Today I tried to get my subwoofer working and have only had a tiny bit more success. I recently purchased this amp to power the sub, in case my current one was the problem. Everything is wired correctly. A standard cable with RCA connectors goes from the subwoofer preout on the receiver (a Denon AVR-S510BT) to the left channel input on the amp. The amp is set to bridge mode with power set to "on" for testing purposes. The speaker is wired to the left positive and right positive as per the manufacturer's bridging instructions. The result: a buzz. I'm getting a significant buzz from the sub. If I turn the amp's volume up to max, it's extremely noticeable. All the way down to around 10% it's pretty clearly audible. The buzz volume changes with the amp's volume, not the receiver. I tried another source on the amp and didn't get this buzz. It's only from the receiver, whether the receiver is on or off. When the receiver is on, I can tell there's audio underneath the buzzing, and when I played a youtube clip with substantial bass, I definitely heard it. So much so that I'm even more frustrated that this buzz is there because I'm excited about how good the bass sounded. I spent about 90 minutes on the phone with Denon and then Monoprice. The best we could come up with was a ground loop. They suggested I try plugging the amp into a different circuit than the receiver. I tried that tonight and it didn't have an effect. Should I even bother ordering a ground loop isolator? What do you guys think? Is there anything else I should look at? Surprisingly, the Monoprice support was FAAAR better than Denon. That guy was trying everything, including digging into the Denon manual to look for ideas. The first person I spoke to at Denon listened to my problem, then immediately said "well that's a non-standard configuration, so I can't help." And I'm not really paraphrasing there. I asked to talk to a supervisor who didn't help much more but at least came up with the ground loop possibility. I'm pretty annoyed, because this doesn't seem all that crazy to me. How much different is an in-wall sub connected to an amplifier than your average active subwoofer? Those just have all the components in a box, don't they? ... a ground loop. They suggested I try plugging the amp into a different circuit than the receiver. I tried that tonight and it didn't have an effect. Should I even bother ordering a ground loop isolator? ’Ground loops’ (and grounding issues in general) can be tricky to diagnose. Does the amplifier have a two or three pin power plug into the wall AC? Is the subwoofer itself grounded? Have you tried non bi-amped mode on the sub amplifier? Have you tried connecting everything (everything including all things plugged into the other receiver inputs) to the same power bar, into a single AC outlet? Don't say that! I've ordered an inexpensive isolator (~$10) just to try it out. I'll start there for an easy fix, but I'll also try your suggestions to test the problem. Excellent question. I believe it's two but I'll check next time. I'm pretty sure it's a built-in power cord and those usually seem to be ungrounded. It's also not a very high-end model so who knows where they cut corners? Nope and I wouldn't know how. I have not! I'll give that a shot. It's not like I need all 200 watts considering the small children who live in the house. Everything is on a single very long power strip with about 12 outlets on it. Well, I received the ground loop isolator today and yes, it did seem to reduce the buzz significantly...but also seemed to choke the volume completely. I could barely hear anything out of the sub when the isolator was in place, where removing it brought back pretty loud bass (but also the very loud buzz). I took the amp out of bridge mode and that didn't do anything. The receiver does have a two-prong ungrounded plug but I can't reverse it. Tomorrow I'll try to plug the receiver and amp into another circuit in the house (with a pretty long extension cord) to see if that makes a difference. That's interesting. Because ground loop isolators tend to reduce high frequency response, and thus I usually try to avoid using them, I would have thought a subwoofer would have been the perfect place to use them since high frequencies are not needed. I'm assuming these were opto-isolators? I tried another source on the amp and didn't get this buzz. It's only from the receiver, whether the receiver is on or off. Can you describe this in more detail? What exactly do you mean by "tried another source on the amp"? While we're here, how is the receiver output wired to the subwoofer amp input? Also, how sure are you of the ohms of the subwoofer, since the sub amp probably requires different wiring for 4ohms or 8ohms. Apple TV and Tivo would also bring the TV into the equation. Everything in a connection chain can cause or link ground loop noise. If the ground loop isolator has a spec for frequency response, it may roll off into the lower Hz range. It may also have an insertion loss dB spec, perhaps even a frequency chart. Generally speaking, connecting portions of the linked equipment to other/distant ground points won’t fix ground loops. Often make it worse. Electricity always travels in a loop, including induced ‘noise’ current from ground point voltage differentials. The key is to find where the different ground point voltage potentials are located and somehow break the circuit loop through your equipment. I'm assuming these were opto-isolators? I used this. I admit to having no idea if that was a good idea or not. I just used the black connectors. I was unclear about which direction to hook it up, so I tried both ways. I simply attached the only playback device I had handy, a Chromecast audio. Naturally, music sounded like crap through the speaker but I didn't get the buzz at all. While we're here, how is the receiver output wired to the subwoofer amp input? Simple cable with RCA connectors on each end. All I had lying around was a composite cable that I just peeled one wire off of. This has worked for me in the past. Clearly not a great cable but it should work, no? Also, how sure are you of the ohms of the subwoofer, since the sub amp probably requires different wiring for 4ohms or 8ohms. Pretty sure it's 8ohm. It's no world-beater, but I just needed something basic. The only wiring difference on the amp is that I believe I couldn't bridge a 4ohm load, so yeah that would probably have problems, but I tried wiring as a single channel load anyway and had the same result. Good point. I'll check the TV plug polarity since I'm sure that one isn't grounded either. Maybe a different power strip? Would a backup battery help mitigate this? I didn't think about frequency range of the isolator, I'll admit. And the Amazon listing doesn't mention it...and it didn't come with any documentation. Perhaps I need to find a receiver with a built in sub amp? Does such a thing exist? Unless the isolator has a battery inside (thereby allowing a powered onto-isolator circuit) I am going to guess it contains a pair of tiny audio transformers. Low frequency (bass) signals generally require a more expensive (and generally larger/heavier) audio transformer, which I suspect the inexpensive isolator does not contain. A better quality audio transformer based isolator might provide decent bass signal pass through and eliminate most/all of the annoying noise. It can indeed be frustrating. Audio system engineers often learn some things the hard way, fighting with intractable problems that shouldn’t be happening, but nonetheless, are. Well, early tests are not promising. I haven't had much of a chance to do anything with it, but I just hooked up the new isolator and I'm getting...nothing. No hum! Great! ...but nothing else either. I have the volume on the amp maxed out, and I've adjusted the receiver's sub volume up to max, too. With the isolator in the loop I got nothing. I didn't listen too carefully though as I've only had about five minutes all day to play with it (doing sound system troubleshooting is challenging with work and sleeping kids in the mix). Anyway, I'm clearly disappointed and have no idea what to try next. Update: I asked this question on Reddit and one person suggested the possibility that my coax going into my cable box might have a different ground potential than my home’s electrical system. They suggested putting everything back to where I had the buzz, then unplugging the coax from my cable box. Sure enough, the buzz disappeared! So now I’m going to look around my place for one of those surge protectors with coax connections in it. They said that might help. Update: I asked this question on Reddit and one person suggested the possibility that my coax going into my cable box might have a different ground potential than my home’s electrical system. They suggested putting everything back to where I had the buzz, then unplugging the coax from my cable box. Sure enough, the buzz disappeared! So now I’m going to look around my place for one of those surge protectors with coax connections in it. They said that might help. Don’t bother with the surge protector thing. This is the sort of thing you need. Inline ground isolator for cable TV coax. I am sure there are numerous alternate brands at varying price points. Typically a cable TV feed is grounded at or near the point of entry into the building. Almost by definition this grounding point will be somewhat distant from where your TV and related equipment is located. And sometimes the different grounding points develop/induce a ground loop current in the cables and directly connected equipment. In the olden days of NTSC analogue television ground loop noise might appear as slowly rolling bands across the TV screen. And/or hum/buzz in the sound. I have corrected such problems in the pats using an inline coax isolator. Now that you know where your hum problem is coming from, the fix should be straightforward. That should work, but only if everything else in the setup is also plugged into the same power bar gizmo. This would tie all of the grounds together at a single point (more or less), eliminating any (ground) loops. Or a ground isolator per K447, but you'll still want to plug everything into a common power bar to get rid of other loops. I actually did order one of those isolators last night I decided I didn't want to bother adding another surge protector to a crowded shelf. Reading back on all of your symptoms and diagnosis steps, I can't help but think that this is due to a bad component somewhere in the chain. If the coax ground isolators work, then awesome. I'm super curious if that works for you. But if not, consider the possibility that either the subwoofer amp is bad, or the cable tuner box is bad. Looking at the web page of the isolator device, I notice that it's a female-female device, meaning that you're going to need a short section of male-male patch cable to connect it up, as illustrated. So I'll bet that's going to be easiest at the cable box itself. Also, if that works, I'm wondering if you should just be fixing the cable grounding problem instead of using an isolator. For instance, where my cable drop comes into the house, there's a ground wire connecting it to an exterior pipe that goes into the ground. Maybe that's all you'd need. Often the problem is not a lack of grounding, more that there is more than one grounding point (your cable TV entry point in this case). It is not uncommon for actual earth (the dirt) to have slight voltage differentials due to electrical leakage from other grounded equipment that has electrical leakage. Yes, the cable TV coax should be grounded to something proper at the entry point. But that ground is not ‘canonical’, it is merely a conduit to discharge lightning and other possible dangerous potentials. For audio equipment, the equipment grouping is effectively is own reference. All the equipment must agree upon and share the same ‘ground’. To do otherwise invites problems. 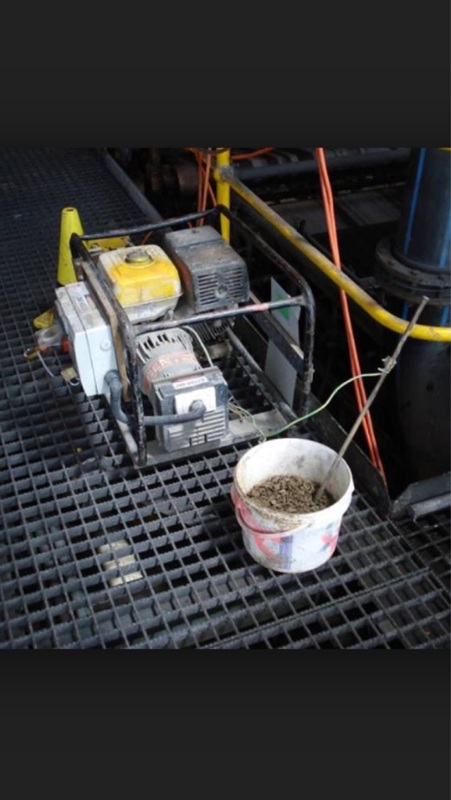 For electrical safety, the shared equipment ‘ground’ must also be connected to a ‘ground’ which is linked back to the electrical system ‘ground’. This is for electrical shock protection, mostly. Not for audio noise elimination. You may see suggestions regarding separating the audio equipment’s ‘shared reference’ from the electrical system’s safety ground, sometimes called ‘lifting’ the ground (removing the third pin on a power bar cord, for example). While this may, in some cases, resolve the hum noise, there is risk of creating a safety hazard. Regarding the coax isolator, I suggest installing it at the cable tv box, not the entry to the building. Thanks, folks. I'll take a look at the Fios ONT box outside. I don't know how/if Verizon grounds those things on the coax side. I don't think the cable box its self is the problem. It's a Tivo Bolt and isn't very old. I just remembered something. A while back (can't remember how long), I was starting to get some really weird behavior from my Tivo recordings. A lot of cut-outs, garbled video, and incomplete recordings. Eventually I called either Verizon or Tivo and they recommended simply unscrewing the coax from the back of the box and screwing it back in. They said it releases some static buildup or something. It did fix that problem. Sounds like it could be related, no? I just got a Bolt myself recently, after my series3 HD finally gave up the ghost. I really like some of the new features. One I just discovered was, if you're on a TV show in standard def, but an HD version is available, you can press the "D" button on the remote to automatically switch to the HD channel of that show. Nice trick. Your description of the need to disconnect and reconnect the cable TV coax line to solve problems with the signal does indeed sound related. It makes me more even more suspicious that that line is not properly grounded. Totally agreed. But if the cable line isn't grounded at all, it seems worth a try, especially if he's having the aforementioned problem of "static build up" in the cable line. Definitely the easiest part of this whole process. Coax is super easy to terminate. I made a little 8" jumper in about 2 minutes. That's super cool that the solution was so simple. 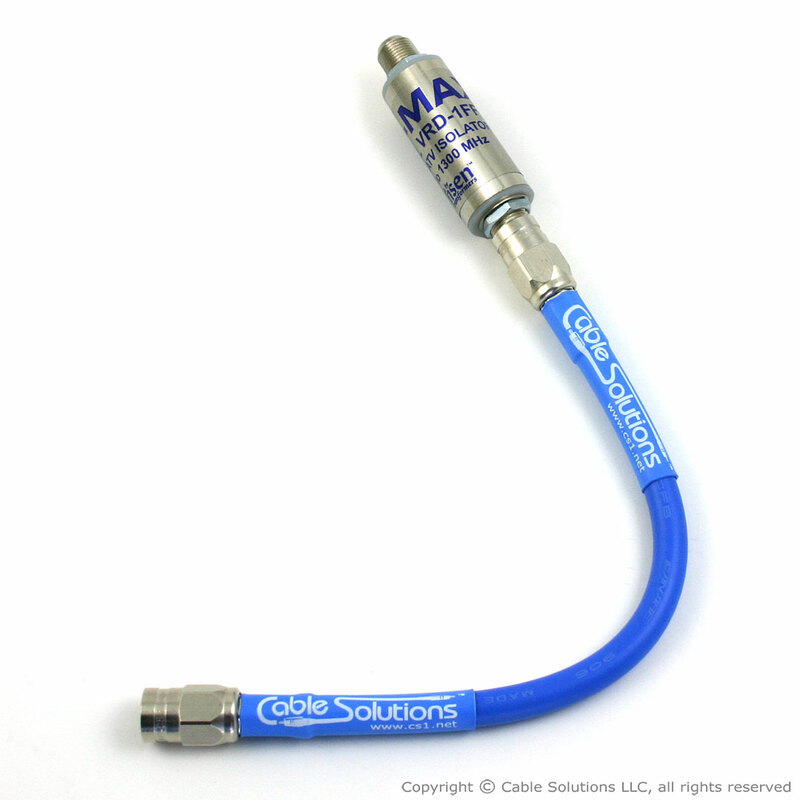 Does your digital cable TV feed continue to work well, without dropouts or glitches, with the isolator in place?